BROWARD COUNTY, FL - Port Everglades, a major sponsor of the recent AGRITRADE Expo & Conference 2013, the largest international agricultural trade show in Central America, announced that Guatemala is a key target market for the South Florida port. 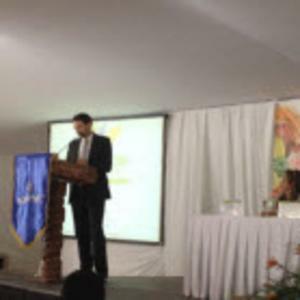 All the key stakeholders related to the agricultural sectors of Central America gathered on March 14-15, 2013 in the colonial city of La Antigua, Guatemala for AGRITRADE. Hosted by the Guatemalan Exporters Association, AGRITRADE focused on integrating and strengthening the agro-industrial sector in the region and showcased the best of the region’s vegetables, fruits, and ornamental plants, foliage and flowers, as well as supply chain products and services. The event also offered Port Everglades staff the unique opportunity to meet with Guatemala President Otto Pérez Molina and other government officials. Three marine terminal operators at Port Everglades provide weekly service to Guatemala: Crowley Liner Services, King Ocean Services, and Chiquita/Great White Fleet. The top imports from Guatemala to Port Everglades include bananas and other fruits, vegetables, t-shirts and other clothing, containers and drums, scrap metal and mineral oil. At the crossroads of North-South and East-West trade, Port Everglades is one of the nation’s leading container ports, handling nearly one million TEUs annually and serving as a gateway to Latin America, the Caribbean, Europe and Asia. Port Everglades has direct access to the interstate highway system and the Florida East Coast Railway (FEC) intermodal hub, and is closer to the Atlantic Shipping Lanes than any other Southeastern U.S. port. Ongoing capital improvements and expansion will ensure that Port Everglades can continue to handle future growth in container traffic. A world-class cargo handling facility, Port Everglades serves as an ideal point of entry and departure for products shipped around the world. More information about Broward County’s Port Everglades is available on the Internet at porteverglades.net or by calling toll-free in the United States 1-800-421-0188 or emailing PortEvergladesCargo@broward.org.